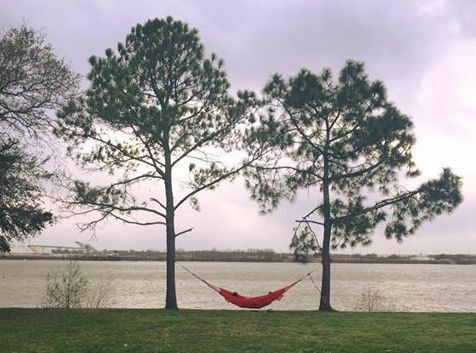 Space for unrestricted use of Audubon Park, such as stringing up a hammock to enjoy the riverfront Fly area, is at a premium, and commissioners are eying further development opportunities. It’s been two years since Save the Fly NOLA mobilized against attempts by the Audubon Commission and Carrollton Boosters to privatize and develop a large portion of the Fly. For those of us who haven’t been attending the Audubon Commission’s master plan meetings, it would be easy to assume that the dust has settled. Park lovers of all ages and ethnicities continue to share the riverfront Fly peacefully with the Carrollton Boosters, and a promised new public bathroom facility is finally being built. But after hearing Audubon Institute president Ron Forman and park master plan architect Mark Ripple advocate for “finding a balance” between recreational activities and passive green space on the Fly, many of us suspect that Audubon Park, like our Louisiana coastline, is rapidly disappearing. Finding what park brass call a “balance” in park usage is a driving force behind the public hearings the Audubon Commission has been holding as they attempt to complete a final version of their master plan, a document in development for over 15 years. But their focus is wholly on “maintaining and enhancing amenities,” not — as it should be — on preserving and optimizing existing green space. Finding that elusive “balance” between development and stewardship of passive green space requires an analysis of current park acreage and usage. But the commission has provided very little of the empirical data that makes an intelligent decision possible. How many acres is Audubon Park and how many acres are free and accessible to the public? Or how many acres are reserved for pay-to-play or pay-to-enter usage? When asked at the last public hearing, Ripple was unable (or unwilling) to provide information on acreage. And, as this column was written, the data were still unavailable on the master plan website. Without data points, how can park officials possibly come up with an acceptable balance of uses? The park master plan needs to focus on reclaiming green space for public use – not on development. To encourage more informed, data-driven conversations about the future of this vital city asset, Save the Fly NOLA asked Justin Kray, the primary cartographer for the citywide 2010 New Orleans Master Plan and current head of City Park for Everyone Coalition, to delve a little deeper into the current usage of Audubon Park. He did similar work on the 2015 City Park master plan, analyzing land use and open space. Using the city property assessor’s records, Kray determined the total Audubon Park area (excluding Magazine Street) to be 320.53 acres. Kray included both the zoo and the golf course in his overall park footprint. For reasons not fully explained, the Audubon Commission’s master plan deletes them. The lighter color on Kray’s map identifies remaining green space. The riverfront Fly is on the left. The golf course, on the right, is separated from the zoo by Magazine Street. Next, Kray established the total area of Audubon Park that can be considered “open space,” by the Region 1 EPA definition, to be 53.84 acres. (The EPA defines open space as any “open piece of land that is undeveloped, has no buildings or other built structures, and is accessible to the public. Open space can include green space, playgrounds, public plazas, and public seating areas.”) In this calculation, Kray excluded the zoo, the golf course, parking and surfaced roadways (except the jogging path), facilities that have a pay wall, and areas that are used for limited and specified purposes, such as the soccer fields and baseball diamonds on the Fly. Bottom line: 16.8 percent of the park is “open space,” as defined by the EPA. In other words, roughly five out of every six acres in Audubon Park, Uptown’s urban jewel, are not available for free and unrestricted use by the general public. So our park, the work of John Charles Olmsted,* the nephew and adopted son of 19th century landscaping genius Frederick Law Olmsted, has been reduced to a strip enclosing “amenities,” some of which are inaccessible or cost-prohibitive to a significant percentage of New Orleanians, including children. New York’s Central Park, the Frederick Law Olmsted masterpiece, provides a depressing basis for comparison. There the balance between open and encumbered land is the exact inverse of what the Audubon Commission has managed to achieve. Fifteen percent of Central Park is for designated uses, leaving 85 percent for passive recreation (such as walking, reading, bird watching, picnicking, tossing Frisbees, and other traditional, non-monetized pursuits). Life in the Big Easy is not easy for every resident, as we all know. In a city where the median household income is $36,964 and 39 percent of children live in poverty (a deplorable 17 percent above the national average), parks – real parks, defined here as open and accessible green spaces – are a necessity, not an amenity. If a balance is to be struck between passive open space and recreational/commercial space, the data shows that the park master plan needs to focus on reclaiming green space for public use – not on development. We urge the Audubon Commission to dive deeper, to replicate and double-check our study. Proper stewardship of our park means conserving green space, not overseeing a proliferation of so-called amenities. Otherwise, Audubon Park will be lost forever. *An early version of this column mistakenly attributed Audubon Park to landscaper Frederick Law Olmsted, rather than to his nephew and adopted son.